I am always trying to find the best products for my babe and it's so hard with all the competition out there to find products that not only work amazing but are healthy options too. 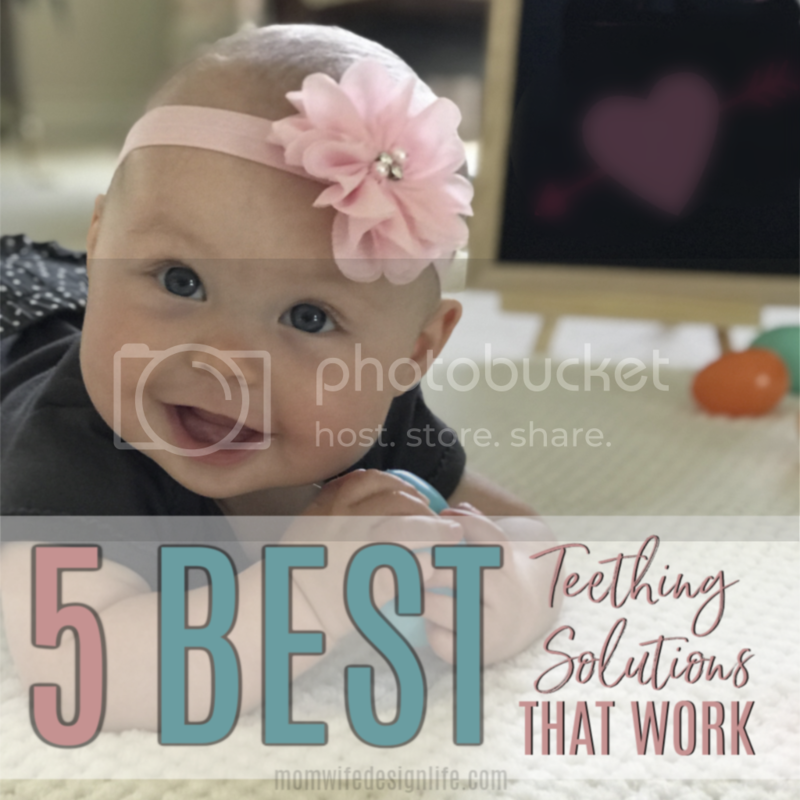 I recently discovered WINK products after seeing all the news about how Orajel and the product Benzocaine is bad for babies, but I wanted something I could give my then 4 month old to help with her teething. I mean, she was miserable, and I wanted to do anything I could that could help her while also making sure what I was doing was a safe option. I mean, what mom doesn't want their baby to be pain-free? 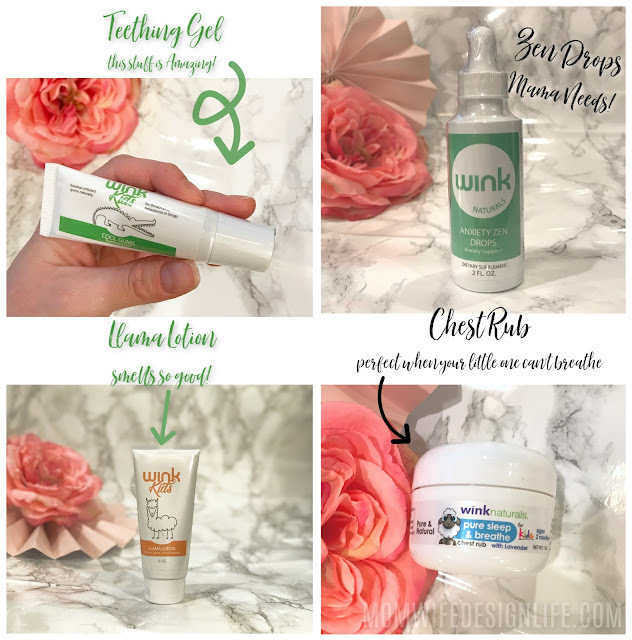 I found WINK Teething gel and kept hearing how amazing it is, so I decided to try it out. Initially I was a little hesitant at the cost, but for a product to work THIS GOOD and be good for my sweet girl is totally worth it in my book. Plus, they often have great deals on their products. Right now you can get 2 tubes for $17.99. It's really not that expensive and a little goes a long way! I met Blythe through networking trying to find a way to purchase the teething gel, and I am SO glad I did. She was not pushy, but she was very informative and answered all the questions I had. When you can develop a friendship over some totally awesome products, that's a WIN in my book. Other uses: Teething Gel can also be used for braces, mouth irritation, sensitive teeth, soothing for nursing moms, and toothpaste training. When I first received the Teething gel, I noticed the yummy mint smell. So of course I tried it to make sure it wasn't going to be too overpowering for my sweet girl. Much to my surprise it has a very faint mint taste, so it's something that can be used once or even several times throughout the day to soothe pain. Once I knew Mackenzie was experiencing some pain with her gums, I rubbed a small amount on her gums. I swear to you, it was an INSTANT relief for her. I couldn't believe it. And I'm not trying to sell a product and by no means do I get commission or an incentive for mentioning this product. I am telling you, as a Mother, in my honest opinion, this stuff WORKS. She doesn't try to fight me when I give it to her either. Anything else we have tried, she literally throws a fit, but with this teething gel, she sits there and opens her mouth for us. It's a little crazy, but I don't mind it one bit. Whatever makes my life easier and keeps her pain-free. So after trying out the Teething Gel, I knew I wanted to learn what else WINK Naturals had to offer. So purchased a little bath bundle deal they had at the time and that's how I knew, I was really hooked on this stuff. The foaming bath is easy to use and doesn't leave any gross residue on my girl. The llama lotion has a pleasant scent and is very comforting. They even have a safe chest rub, which I actually used on myself when I had some congestion and it really helped me feel better. I then used some on Mackenzie's chest before she fell asleep one night when she was having some sinus problems. She slept great that night, so I knew it was helpful for her to have something soothing. I also really love the llama lotion. It smells AMAZING and isn't oily. It's great for babies but also can be used on toddlers and adults. I love it so much that I paired up with my favorite Wink representative, Blythe,to have a GIVEAWAY! Who doesn't love giveaways? Especially before the Holidays! There will be FOUR WINNERS. Each winner will get a different prize (Listed below). The giveaway will run from 12/12/18-12/19/18. Pacific Standard Time. Open to US residents. Leave a comment letting me know what Wink product you would LOVE! Here's another great FREEBIE for you! You can score 2 FREE baby shoes! They have a wide selection of adorable shoes for your little one. Or they would make a great gift for a baby shower or Birthday! Which pairs are your favorites? I personally love the canvas sneakers and the moccasins! 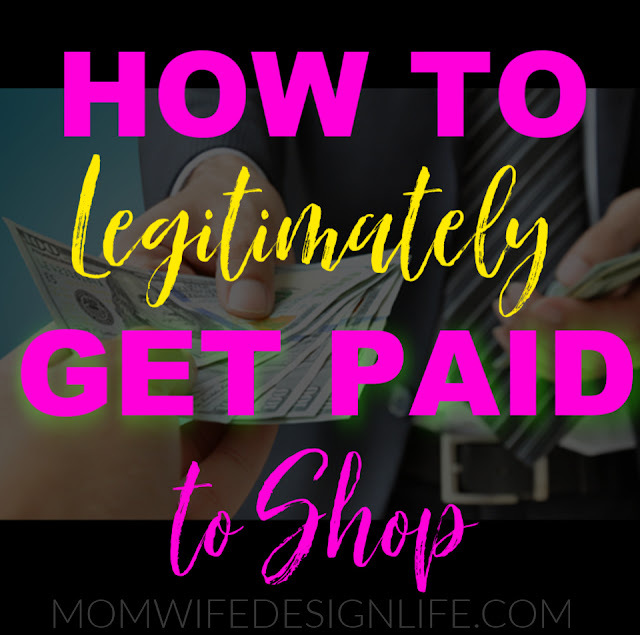 What If I told you that you could get cash back just from shopping like you normally do? This isn't a scam, there's no gimmicks, you legit get CASH back. I've been trying to figure out how to write this post without sounding like I'm trying to sell you something, because that's totally not what I'm trying to do. I really just want to get the word out, because, who doesn't love extra money? Think of it like an affiliate link.. but YOU get the profits. AND right now, for using my link, Ebates will give you $10 to shop online. That $20 gift for Christmas is now only $10 to you! I've been using ebates anytime I shop for the last few years. I understand it, I know how it works and how beneficial it is for my family. So I wanted to explain everything so that it's easy to understand and helpful for those who might think it's too complicated. It's really not and that's what I am here for! You can either use it when you shop online, or they also have IN-Store shopping option. Ebates doesn't cost you a thing. There's no signup costs, no fees or forms to fill out, no complicated tasks to complete before purchase. You just shop like you normally do but link up your cards to the stores you are shopping at. Each store has a different cashback option. These options change overtime and depending on how competitive the stores want to be. Sometimes they go up to 40%! I know when I am shopping for Christmas gifts, I tend to favor certain stores because of how much cash back I can get. So obviously their tactics are working, at least for me. A few bucks here and there add up pretty quickly. My last check I received was $127.53, and I don't even shop THAT much. So just think how much you could be getting. Notice on the second image above, the "link offer." I link my credit and debit cards so that when I shop in store, I get the credit. All you do is click "link offer" and link your cards. It's that easy! I know you might be thinking, how does it work? Ebates is basically like getting a "rebate" back for the stores you shop in. 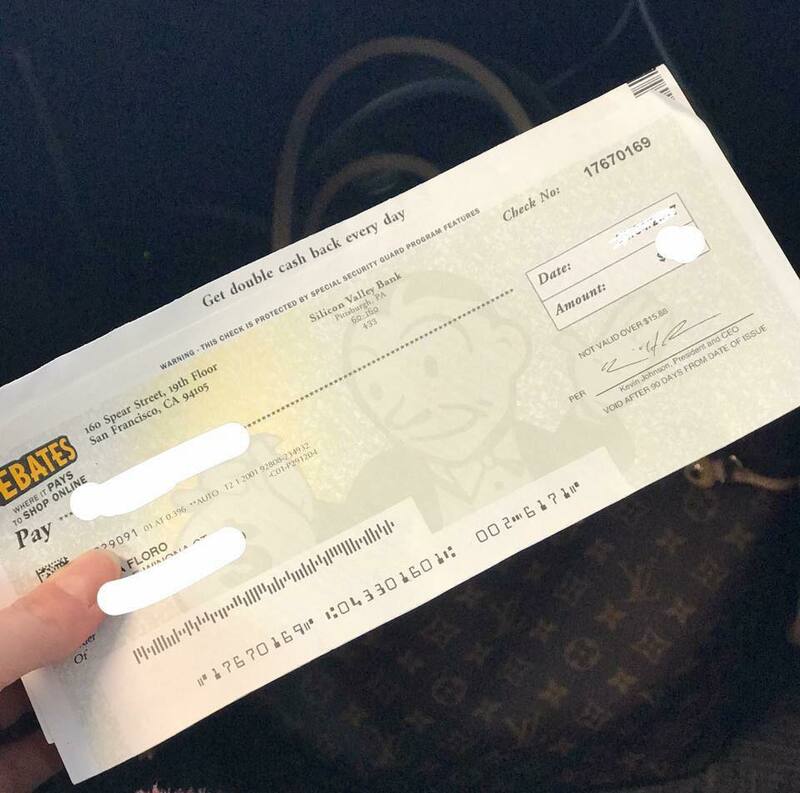 In return for sending the websites and stores traffic and paying customers, the companies give Ebates a commission. That's how you get cash back. You can either use Ebates online or download their app. I recommend the app, beccause you can use it on the go and find out which stores have what % back while on the go. I also like to link my cards to the particular store I know I will be shopping in that day. Don't forget to link your card! **TIP: If you shop at let's say KOHLS and link your card, you will need to re-link your card to shop there again to receive an additional cash back. In-store cashback: If you add your credit or debit card to Ebates’ system and link your account in the settings menu, Ebates will be notified when you shop in their partner stores and pay with the card. Then, you receive the rewards just as you would online. Online cashback: Once you have an Ebates account, simply enter the store of your choice from Ebates.com, and your purchases will contribute to your cashback amount. Double cashback: As its name implies, this features provides members with double the cashback reward on purchases. The list of participating stores varies, and updates to the list are reflected on the Ebates app and website. Travel and Vacation: Ebates curates an ever-changing alphabetized list of flights, hotels, cars, and rentals with cash-back opportunities. They even have Lyft as one of their partners. You can also input your travel dates and locations for specialized deals. 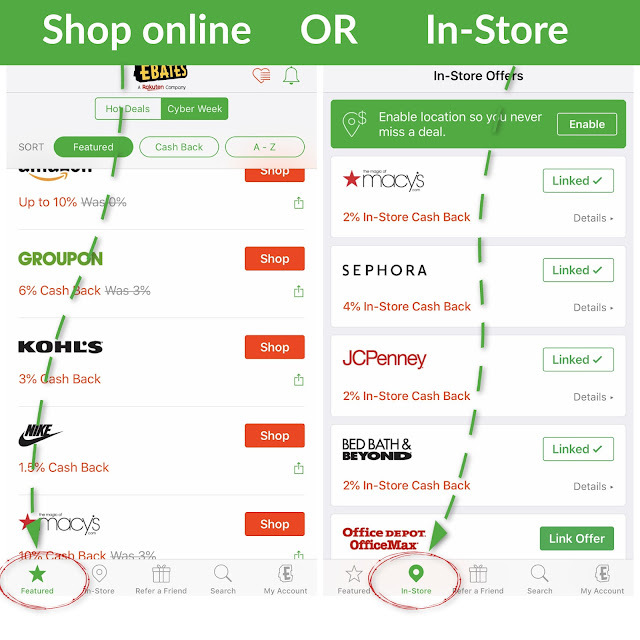 BOGO: With this tool, Ebates features buy-one-get-one promotions currently running at its partner sites, scoping out the best deals for you and allowing you to get cashback at once. It’s a double deal! Gift Cards: This is another simple way to earn with Ebates. Next time Christmas or a loved one’s birthday rolls around, consider purchasing your gift cards through Ebates. Some partners on the site offer as much as 10% cashback on offers! You can also get cash back for referring your friends! Here is a short video below of my Ebates app on my phone. As you can see I am scrolling the Shop online option, and then I switch to the In-store option. See how many stores are available? I bet you see a lot that you already shop at. Listed next to each store you will see a percentage back. That's how much you get back for shopping. *With an A+ rating from the Better Business Bureau and a multitude of credible retail partners, Ebates is a safe and reliable way to make the most of your purchases. Let me know if you sign up, I would be happy to help and answer any questions you may have. I am here to help! I LOVE using ebates on my shopping trips, especially during the Holidays! That's when they have the best % back and that's when I get more $$ back.